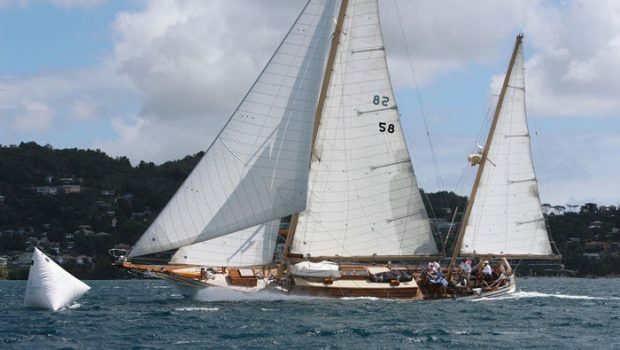 Antigua’s Classic Yacht Regatta began in 1987, and now in its 32nd edition with racing on April 18-23, this year’s collection of history and tradition spans nearly a century with vessels representing each decade since 1924. Built that year is the 64’ Skagen ketch Samsara and the newest build, 44’ Spirit of Tradition sloop Willpower, was completed just months ago. Between them lies an impressive array of history and volumes of sea stories. Competing will be the Klaus Röder 158-foot Tall Ships Chronos and Rhea, seven highly charged 29-foot Petticrow Dragons, and the Carriacou built 32-foot sloop New Moon. Joining them are 66-foot Herreshoff ketch Arrluuk and 72-foot Fife ketch Eilean along with enduring designs from Alden, Mylne, Starling Burgess, Sparkman Stephens, and more yachting genius. Boats reach Antigua from all quadrants of the compass and with great effort. Several took part in the Panerai Transat Classique from Lanzarote to St. Kitts. 47-foot schooner Avenger set sail from Nova Scotia on Christmas day. 72-foot Dirigo II is underway from the Panama Canal. 52-foot yawl Mah Jong, t-boned in Grenada, sailed straight from the Carriacou boatyard and 50-foot schooner Charm III, nearly destroyed by a category 5 hurricane, is back in the water and race ready. Only one race is required to complete a series because everyone wants the parties to be official. Antigua Yacht Club in Falmouth Harbour is the stage for nightly events including an organic hog roast, the unpredictable Sea Shanty Contest, Musical Night and Prize Giving Ceremonies. Popularly scheduled are the Concours d’Elégance, Dock Party evening, Parade of Sail through English Harbour, and Gig Racing and Cream Teas at the Admiral’s Inn. The combination of casual competition combined with plenty of adult beverages, sunshine, and great camaraderie in a friendly relaxed atmosphere returns the sport back in time, to a time when these yachts were less classic and more contemporary, and the Corinthian climate was alive and well.